This page takes the results from Your Abilities Worksheet, and Your Interests Worksheet, puts them together… and hopefully helps narrow down a few possible career choices for you! What groups can you say you are BEST AT? i.e. those with GREEN BARS in the ABILITIES column? What groups can you say you are MOST INTERESTED IN? i.e. those with GREEN BARS in the INTERESTS column? GREEN in both ABILITY and INTEREST? ORANGE in either ABILITY and INTEREST? RED in either ABILITY and INTEREST? 2. You are looking for those groups which you said that you were ABLE to do AND which you LIKE doing! In other words… groups with TWO GREEN BARS. 3. If you have TWO ORANGE BARS for any groups, you MIGHT be able to develop your abilities and/or your interests enough to consider doing some of the jobs that fit these groups. 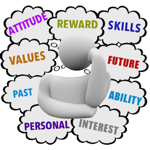 Do you think it is possible/necessary for you to try to develop further abilities and/or interests? What these groupings actually mean.